The "Rose Wonder" stamp set has a beautiful script and includes a "with sympathy" stamp. Pair that up with the matching Rose Garden Thinlits Dies, and you've got the makings for an elegant, special card. Today's card is stunning in its simplicity. I started by cutting the large rose and leaves thinlits die from the Rose Garden set from Whisper White Card Stock. I adhered this to a Whisper White panel using the awesome Fine-Tip Glue Pen. Then I adhered this to a Basic Black mat. I tied a length of Basic Black Stitched Satin Ribbon around these pieces before adhering them to a Whisper White Thick Card Stock card base, cut lengthwise. 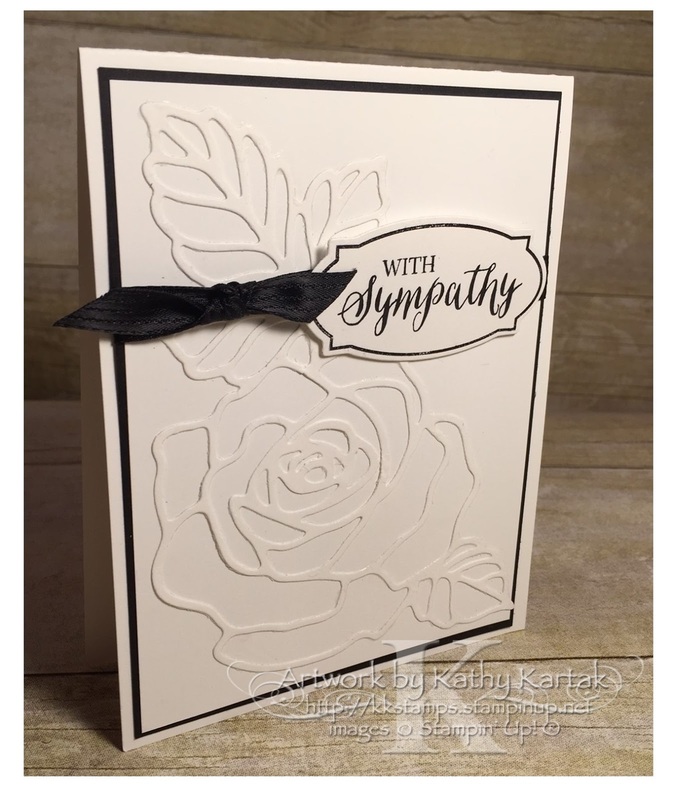 I stamped the "with sympathy" sentiment in Basic Black Archival Ink on to a Whisper White scrap and also stamped the coordinating frame in Basic Black. I then used the matching framelit die to cut out the label. I attached the label to the card with Stampin' Dimensionals.